At WreckMonster, we buy cars, trucks, 4x4s, vans, Utes & SUVs for maximum cash and offer free pickup of vehicle anywhere across Sydney, NSW. We pay up to $15’000 cash for used vehicles and this is go even further for the great condition of vehicles. However, our Cash for Cars Sydney team is happy to buy vehicles in any condition including junk, unwanted, scrap, rusty ,leaky, unregistered, fire or flood damaged cars, mechanically faulty (Blown Head Gasket, Transmission Failure, Engine Sized) and so on. Are you planning to sell your car for cash? Have you been asking yourself, “Where should I sell my old car for top cash in Sydney?” Are you also wondering if it’s a correct decision to sell your old or junk vehicle? Do you want a quick and fuss-free way to sell it? Well! We here at Wreck Monster have the best solution to all the pertinent to your unwanted vehicle. It’s obvious that keeping a deteriorating, rusted and not-running vehicle in your garage will badly clutter it. Plus! It will be an eyesore and even trouble for both you and your neighbours. Thus, it won’t be justified to keep on delaying its sale for your property and your wallet. This is where Wreck Monster team can assist you with quick cash for car services. We will rescue you from having a Junker repair costs of which are out of your budget. Moreover, we will instantly replace your old clunker into best possible money. Just obtain a reasonable monetary quote from us today. Our seasoned specialists are so passionate about purchasing and wrecking automobile that we take them all. No matter whether you own a compact family vehicle, commercial truck, sub-compact SUV, van or any other type you can think of. We will take it off your hands for top dollars without wasting your time. Likewise, we never restrict our auto wrecking abilities to some particular brand models. We are always glad to grab them all whether it’s a Japanese, European, American, Korean, or Classic vehicle. Therefore, you can definitely sell us any major brand including Daihatsu, Isuzu, Chrysler, Ford, Mercedes Benz, Peugeot, BMW, Mitsubishi, Holden, Honda, Daewoo, Hyundai, Lexus, Mazda, Volkswagen, Skoda, Audi, Nissan, Suzuki, General motors, etc. Overall, We buy all European, American, German, Korean, Japanese and classic model of vehicles. Previously, people had to waste a lot of hours online in looking for the right buyer for their wheels. However, with us you don’t need to exert efforts on advertising and preparing your old ride for sale. You should just trust us to get top quality cash for car services. 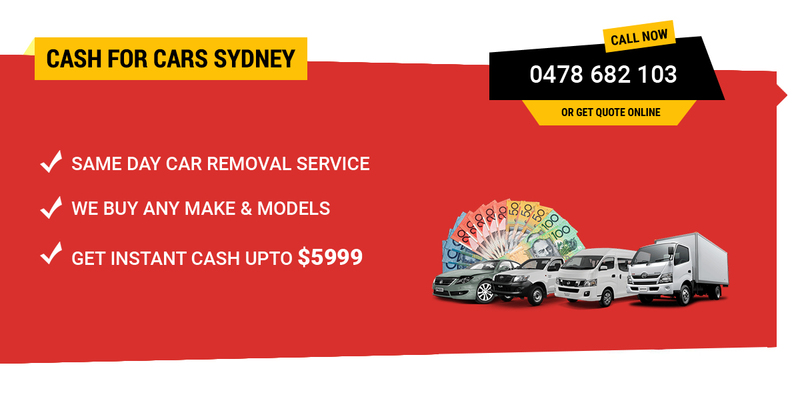 As we rank at the top among the best cash for car service providers in Sydney, New South Wales. We will help you to get rid of that rusty automobile on the same day. Beside this, we also assure to offer you a process that is simple, smooth and very rewarding. You don’t even need to indulge in unreasonable haggling. It’s because we will pay you the top notch cash up to $9’999 to $15’000, considering your vehicle’s condition. We remove all types of automobiles, whether running or not running. It could be also totally wrecked, busted, damaged or burned. We will offer free and quick removal service for it from any location in NSW. This includes all the places in which we often operate our FREE and easy removal services: Penrith, Campbelltown, Ultimo, Richmond, Baulkham hills, Greenacre, Liverpool, Parramatta and more. Additionally, we have been delivering free pickup service from many years now. So, whether you have a luxury vehicle, damaged truck, broken SUV, rusted sedan, etc. We will be more than interested to help you let go of it within minutes. You can also trust us that we won’t charge you any extra penny for auto removal. Our experienced team strives to keep the complete process free and quick. From auto valuation, organising the paperwork to auto removal everything is free of cost. Therefore, take the first step and talk to our dependable staff today to request a no-obligation quote. We will be glad to resolve your cash for clunker needs. Book a free car removal in Sydney today. At Wreck Monster, we have professional and skilled auto evaluators in our team. We are licenced vehicle recycler business. They are veterans in the trade of all kinds of automobiles. Thus, we not only offer quality cash for car or auto wrecking services. But we are also best at offering top-notch cash quotes for wide range of vehicles. You don’t need to make much efforts to contact us and request cash quote. Simply grab your phone and dial the incredible number- 0478 682 103. Or, if you wish, fill out the appraisal from given on the top right side of our site. When you do this, you need to provide us all of the key information associated with your automobile. This will include: the make and model of your ride, its age and existing level of damage in it. We focus on completing the process of finalising the deal within the same day. So, our friendly Cash for Cars Sydney experts will speak to you directly.